Hey Everyone! This past week I was still obsessing about 32nd note drum lick ideas and one of them really stood out. I tested it out on a gig last week and I loved it, so today I present it to you. 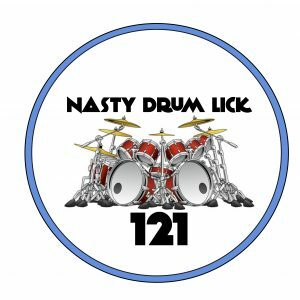 It’s #121 and it combines a left-handed paradiddle with the pattern Foot-Right-Left. The FRL pattern is phrased as 32nd notes, and the lick has a very natural feeling sticking that will allow you to move between the lick and a groove or almost anything else you want to add after it. Try it out and let me know how it goes! Email me at bangthedrumschool@gmail.com or just leave a comment and I’ll answer you.